The castles of Wales are what foreign visitors want to see the most in Britain, a new survey suggests. Researchers spoke to 10,000 overseas holidaymakers, who put a tour of Welsh castles as their "must-do" activity on any trip to the UK. Castles came ahead of Buckingham Palace, Harrods shopping, a Premier League football match or whisky tour. The questionnaire was carried out for Visit Britain, in 20 countries across the world. Those surveyed were given a list of 18 activities they could undertake while in Britain, and asked to pick the ones they liked the most. Welsh castles topped the list, with 34%, ahead of visiting Buckingham Palace at 32%. "It is striking that touring Welsh castles was so popular - and the top four choices were right across Britain, in Wales, London, Scotland, and England," said Visit Britain director, Patricia Yates. "These results show how powerful our culture and heritage is in attracting foreign tourists and the global appeal of experiences that you can only find in Britain." A tour of castles was especially popular with Polish and Russian holidaymakers, with nearly 50% quizzed opting for the Welsh choice. "It all strengthens our conviction that we have a great tourism product that we will be able to showcase on the back of the forthcoming Royal Wedding and 2012 Olympic and Paralympic Games to deliver a permanent increase in tourism- and the economic benefit and jobs that will result - across the whole of the UK," added Ms Yates. 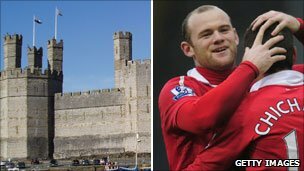 Welsh castles also beat off staying the night at a Scottish castle, watching sunrise at Stonehenge, or watching a Premier League football match. Heritage minister Alun Ffred Jones remarked: "I'm delighted that Wales' castles are such an attraction for our overseas visitors. "Our 641 castles tell the captivating history of our past and are located in some of the most beautiful spots; it's no wonder that they've also captured the hearts and minds of those who took part in the survey." His comments come as new figures revealed that the Welsh tourism industry weathered the last summer, despite a fragile economy. Between January and September 2010, 7.28m UK residents spent at least one night in Wales, down just 1% on 2009. However, the amount of money being spent by UK visitors actually increased by 3%, up to £1,237m. The figure compares with a 6% drop in holiday spending for the UK as a whole. Welcoming the figures, Mr Jones added: "The results are a testimony to the hard work, resilience and professionalism of the sector." The minister said tourism, which contributes around £4bn a year to the Welsh economy, will remain a "key priority".